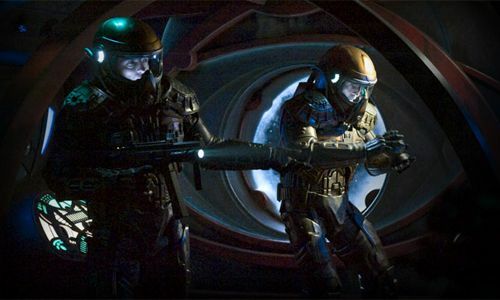 Cultural Wormhole: Stargate Universe - "The Greater Good"
Col. Young (Louis Ferriera) and Dr. Rush (Robert Carlyle) explore the second ship to cross Destiny's path this season. Rant #1: Before I begin the actual review, I've got to comment on Syfy's awful spoiler problem. The spoiled a couple of things on 'Caprica' with the commercials and this problem seems to have infected 'Stargate Universe'. The ending of "The Greater Good" was an intense cliffhanger. Instead of waiting in anticipation for next Tuesday, the people that edited together the preview for the next episode completely gave away the resolution. Way to be sloppy, there Syfy. Rant #2: Also, there has been a bit of negative chatter on message boards about the "unrealistic" pairing of Eli and Ginn. Yes, Ginn is cute and is in fact female. Yes, Eli is a slightly overweight gamer. But are sci-fi fans full of such self-hate that they can't even fathom the possibility of such a relationship? First of all, Ginn is nerd herself. She gets all excited about gate technology and she thinks Eli is like a rock star when it comes to that research. Also, she comes from an alien world with it's one set of cultural standards. Maybe brains trumps beauty. I may have a different opinion if this was Lt. James or TJ, but Ginn is very different. Eli is far from ugly, too. Sure, he's a little thick in the middle, but he's certainly not bad looking. Also, he's funny, charming, and utterly brilliant. In fact, he has already been rejected by a woman that he quickly developed a strong friendship with, Zoe. She did what a lot of these naysayers seem to expect Ginn to do; she kicked Eli to the curb and jumped in bed with pretty boy Matthew Scott, despite the fact she hardly knew him. In real life pretty girls don't date nerds, but they also don't not date nerds, especially if they're nerds themselves. Okay, on to the actual episode. While it's a bit funny that Destiny is happening upon yet another strange ship already, "The Greater Good" was another excellent installment for the series this season. I was also not looking forward to another Young/Rush fist fight, but the end result was a good clearing of the air between them and the resolution of the hidden bridge plot thread. Young and Rush are both damaged individuals and, as Rush points out, both lack the ability to get the whole crew to follow either of them unwaveringly. They need to start trusting and depending on each other if they are to get home or fulfill Destiny's true mission. The revelation of Destiny's purpose opens up some really interesting possibilities. Hurtling towards the origin of all that was and an intelligence even older and more advanced than the Ancients is pretty heady stuff. This goal also runs counter to the desires of many on Destiny that just want to go home. The divisions of these two goals should be more interesting to watch than the previous military vs. civilian conflicts. I know I've already written at length about Eli, but his new found relationship seems to have instilled him with a new sense of confidence. He calmly figures out what Rush has Dr. Perry working on and he's makes his anger pretty clear when he, Brody, and Volker catch her on the bridge. Also, he is complete without any doubt that his calculations for Rush and Young's space jump are going to be correct. Also, he's not afraid to voice his dissatisfaction with Dr. Perry using Ginn's body for 'extra-curricular' activities. He's pretty focused and confident for the most part throughout this episode and I hope this is a sign of Eli's growing maturity. Now, if he'd only get rid of that stupid t-shirt. After Wray and Greer's run-ins with Simeon who obviously doesn't have a healthy disposition towards Ginn, you'd think they would start keeping a closer eye on the guy. I'm sure we'll find out how he got away from his guard next week. At least that one thing the previews didn't spoil. "The Greater Good" and last week's "Trial and Error" are perfect examples of the types of episodes I enjoy from 'Stargate Universe'. Characters continue to develop and the plot stays focused on the plight of the people on Destiny and not on any visitations to Earth via the communication stones. In addition, there wasn't a lame musical montage, so that's always a plus.